(Press Unit in the Office of the Prime Minister) – Prime Minister and Minister of National Security, Dr. the Honourable Timothy Harris, and National Security Advisor, Major General Stewart Saunders, met with members of the Chamber of Industry and Commerce (CIC) and high ranking officials of the security forces to discuss a number of issues related to the challenges and the way forward in addressing crime and violence in St. Kitts and Nevis. 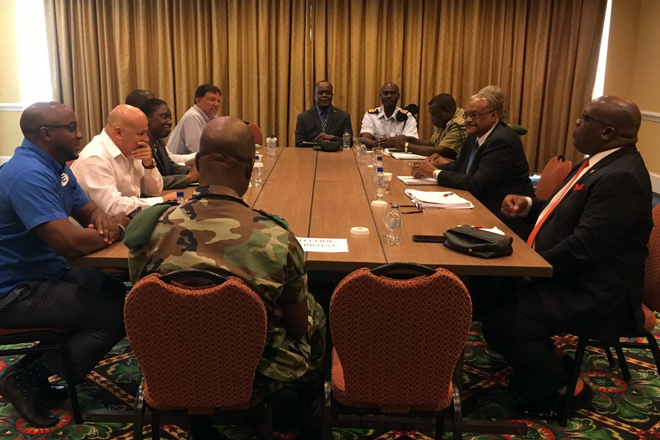 Among those in attendance at Tuesday’s meeting at the St. Kitts Marriott Resort, were Permanent Secretary in the Office of the Prime Minister, Mr. Andrew Skerritt; CIC President, Mr. José Rosa and Immediate Past President, Mr. Damion Hobson; Commander of the St. Kitts and Nevis Defence Force, Lieutenant Colonel Patrick Wallace and Deputy Commissioner of Police, Hilroy Brandy. During the meeting, Major General Saunders was updated on a number of initiatives and social intervention programmes currently being undertaken by the security forces to tackle crime in the Federation. These include the continued implementation of the Government’s massive Closed Circuit Television (CCTV) project and the involvement of the Ministry of Education in curbing anti-social activities among the youth, through renewed social intervention programmes such as the Scouts, Girl Guides and Cadets. Also highlighted during the high level security meeting was the fact that 34 new police and 29 new soldiers are expected to complete their training by September 2017. This, along with the ongoing external recruitment drive, will significantly complement the existing law enforcement numbers in St. Kitts and Nevis. Among the concerns raised were the issue of gangs and gang-related activities in the Federation. As a result, a general consensus was reached among all those gathered that a more concerted effort is needed in the dismantling of these gangs. Members of the Chamber of Industry and Commerce expressed their satisfaction with the recent increase in police visibility throughout the streets, especially along the main round-a-bouts. The Chamber officials also advised the Honourable Prime Minister, Major General Saunders and the security officers present of their intention to partner with the police force to assist factories, and by extension the women employed at the C.A. Paul Southwell Industrial Site, in putting in place afterschool programmes to help keep children off the streets. Chamber President Rosa expressed his willingness to support Major General Saunders in his new role as National Security Advisor, and conveyed his full support for the overall crime reduction strategies being implemented by the security forces and the Team Unity Government. Major General Saunders brings to the post of National Security Advisor over 40 years of distinguished public service dealing with crime at the operational, strategic and policy levels. As a military professional, Mr. Saunders achieved his highest rank, Major General, and retired as Chief of Defence Staff of the Jamaica Defence Force in October 2010. He was appointed Senior Consultant/Advisor in National Security matters in 2012 and later, Permanent Secretary in the Ministry of National Security.